The Wildlife Center of Virginia is currently treating a record 16 black bear cubs – and these cubs have been the featured “stars” of Critter Cam, the Center’s live camera feed. Students at Beverley Manor Elementary School in Staunton have been watching the bears … and decided to take the next step to help the Center feed the bears. The school’s student council, working with the Parent Teacher Boosters, organized a successful drive designed to collect the specific foods that the Center feeds the cubs. 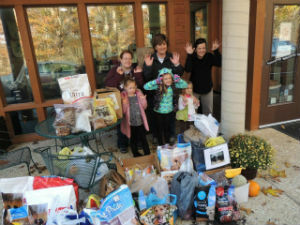 On Friday, Oct. 25, Beverley Manor students and parents dropped off boxes of food at the Center. Michele Savor, Co-President of the PTB and other Beverley Manor representatives dropping off food at the Center – and channeling their inner cubs! Today, the Center honored this special effort by Beverley Manor students to help feed the bears. The Critter Cam was “sponsored” in their honor. The bear cubs are expected to be at the Center for another 10 weeks or so. In mid-January, in partnership with the Virginia Department of Game and Inland Fisheries, the cubs will be released back to the wild. A “mixed” bucket – a half-ration of vegetables [broccoli, carrots, corn, pumpkin] and a half-ration of protein [fish, eggs, crickets, earthworms]. The cubs are currently being housed in the Center’s Large Mammal Isolation unit – an enclosure which includes two connected 16 x 16 feet chambers. Within the next few weeks, the cubs will be moved into a newly constructed enclosure that includes three large “yards” of about one-half acre each. Each yard has trees, shrubs, and other native plants that will give the cubs the opportunity to perfect the foraging skills they will need for life in the wild. Check out the Black Bear cubs – and other wildlife – on the Center’s Critter Cam – at http://wildlifecenter.org/critter-corner/critter-cam-landing.